Happy Monday everyone! I hope you all had a great weekend. I sure did, I went to Nashville on Friday with my bestie and we saw Rob Thomas (the leader singer from matchbox twenty) at the Ryman Auditorium! We have both been obsessed with him/the band since we were 13 years old! It took us 17 years to finally see him, but it was amazzzinnggg!! We stayed the night and explored what Nashville had to offer on Saturday. Much fun was had! Today I'm going to share with you my very first Funky Fingers! Funky Finger polishes are exclusive to the store Five Below, which we didn't have in Kentucky until recently. I was always so jealous of the girls on Facebook who posted their Five Below hauls. As recently as 6 months ago I googled to see if we had a Five Below and we didn't. My husband and I went to the state fair last weekend in Louisville and we wanted to try Chipotle afterwards (another first..delicious!) and when we approached the shopping center where Chipotle was, I saw a Five Below sign. Needless to say, I freaked the f out! A FIVE BELOW IN KENTUCKY?! WHEN?!!! I couldn't eat Chipotle fast enough, I wanted to get to the store and raid their nail polish! My hubs offered to get every single FF they had, but I said no, way too much money right now considering what we spent at the state fair lol. BUT, when we go back, I'm going to remind him of that generous offer :D I picked up these gorgeous jelly glitters as well as 2 others (post coming later). Pink Ladies is a pink jelly packed with glitter. OMG, I just can't with this one! It's so pretty, my perfect pink! Formula was good, application was easy. This is 3 thick coats, no undie. Beauty School Dropout is a purple jelly filled with glitter. Formula and application were the same with this one, perfect. I loveee this purple! 3 thick coats, no undie. Hand Jive is a pretty coral jelly packed with glitter. Just like the other 2 before this, it was perfection! The macro shot was taken in direct light, which explains the color difference. 3 thick coats, no undie. This blue jelly filled with glitter didn't have a name on the bottom! Totally weird, right? If anyone knows what this is, please let me know. It glows in the dark! 3 thick coats, no undies. 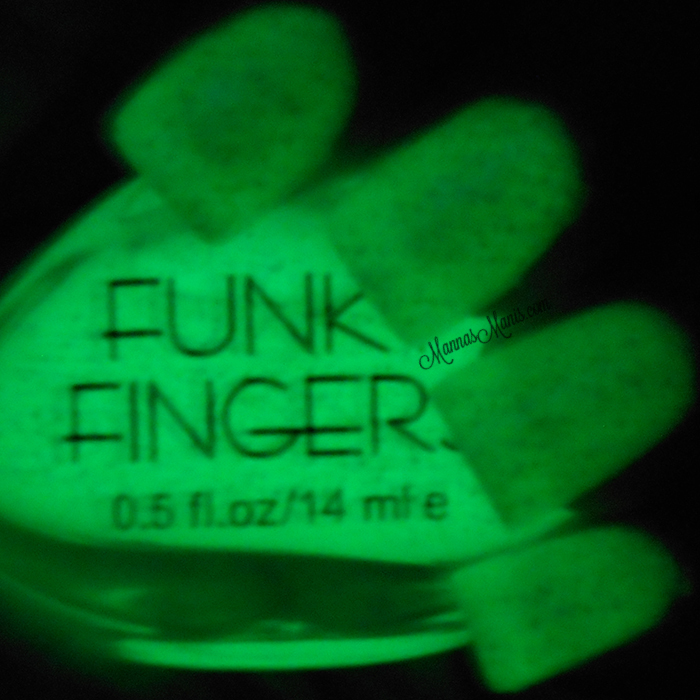 Final thoughts: Where have you been all my life Funky Fingers?! Oh yea, not in Kentucky. But now we have TWO Five Below's, and I will be making another trip soon to pick more up. I was very impressed with these! And at 3 for $5, you can't beat that price. 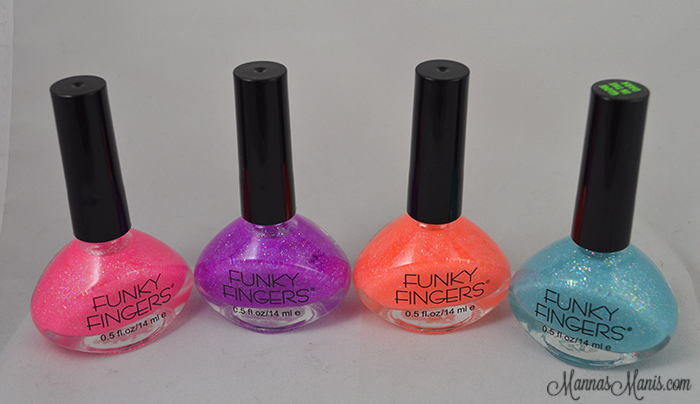 Have you tried Funky Fingers? Which is your favorite?